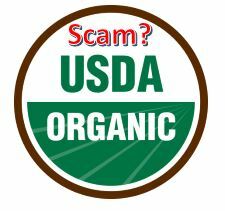 Are Organics a Scam? - Anti-Age Naturally! I just love my readers. A few months ago, after my article about Glyphosates, I received an email from Frank, an organic farmer in southwest Florida. His mom (my reader) had passed along my article. At this time I had no way to prove what Frank was sharing. But I sensed I was getting the inside scoop. So I decided to check out the USDA organics regulations and they are very vague. I did learn that they hire outside agencies to monitor farmers. And from what I can dig up, these agencies only go over the farmers’ receipts. Rarely are soil samples taken, which is the only way to know if something is being grown organically. And since they don’t take soil samples, I can only conclude that they must not be required by the government. Frank and I have stayed in touch and recently he sent me some disturbing news – proof that that my suspicions were real. The headline read, “3 farmers to plead guilty in organic grain fraud scheme”. All knowingly marketed and sold non-organic corn, grains and soybeans as organic. According to the article, fraud will become more prevalent because the organics business has become a $50-billion industry. And many food giants are jumping into the organics game which could mean more corruption. “I suppose my underlying suggestions/hope is that organic consumers understand the costs involved in organic production and to really stress the importance of buying local, from your friendly organic grower, whom you can trust above all $$$$$. I believe we smaller, more local, growers are passionate about safety and quality above the mighty dollar. Please try to instill the trust of your audience in the real, passionate and non-greedy local growers…. True that semi-loads from Mexico etc., are cheaper, but honestly cannot be trusted…. I would also ask to see their certification. And if they are on the up and up you probably won’t have to. They’ll offer to show you. Also ask if their soil is tested. Being diligent and educated is going to be the best way to avoid being scammed. There is one company that I buy from and trust that ships in the U.S. They only have a few produce items. They sell mostly, seafood, poultry, meat and dairy. Click here to check out US Wellness Meats. And if you missed my first article on glyphosates I’ve posted it below. Foley, Ryan J. 3 farmers to plead guilty in organic grain fraud scheme. AP News. October 11, 2018. Defarge N., Et. al. Toxicity of formulants and heavy metals in glyphosate-based herbicides and other pesticides. Toxicol Rep. 2018.